Part outbreak / contagion / zombie / vampire movie, Rabid is a wonderful little nugget of exploitation horror Canadiana. On this episode of the Really Awful Movies Podcast, we examine David Cronenberg’s masterpiece, starring ex adult film star Marilyn Chambers as Rose, a young woman who’s involved in a motorcycle crash and who undergoes life-saving experimental surgery at an oddball clinic. It’s at this clinic (the Keloid Clinic) where she’s given a skin graft for burns. And when she’s in a coma, she starts experiencing strange side-effects. When her friend Lloyd visits, Rose comes to, biting him and penetrating him with an underarm dart (hey, if that sounds weird, we’re in Cronenberg’s wheelhouse, remember) and then biting him. Lloyd starts having odd symptoms. Before you know it, both have left hospital and are spreading something weird, something untoward, something that’s a lot like…rabies! Hence the film’s name. This a gross-out tax shelter movie, the kind we LOVE to watch. Seriously, there are a lot of Canadian exploitation fare that people should check out (Siege, AKA, Self Defence, Search and Destroy, Black Christmas to name a few. Please listen to our Black Christmas podcast!). So, we have an outbreak, and the government has to crack down on it. And there’s lots of sexual subtext (not the least of which being the casting of Chambers), and even some gallows humor. And there’s also the Cronenberg gross-out trademark, and some spectacular kills. With the passing of George Romero, on this episode of the Really Awful Movies Podcast, we look back at the famous horror film director, and examine a real classic from his oeuvre: Martin. “He could be the boy next door,” is the tagline, and this “boy” (played by John Amplas) is en route by train from Indianapolis to Pittsburgh, where he is put under the care of great uncle Cuda. Along the way, we get a glimpse of the “vampire” in action (the question as to whether Martin is a blood-sucker is open-ended indeed), where he feeds on a fellow passenger, knocking her out cold with an anesthetic before meeting Cuda on arrival in the Steel City. It’s an unsettling scene, creepy as all hell, in a film with many wonderful, shocking, and memorable vignettes. Martin is a strange beast, a terrific film that explores some of the rich themes Romero brings up in Night of the Living Dead, Day of the Dead, and Dawn of the Dead: man’s inhumanity to man, the “undead” as a reflecting of ourselves, the animalistic nature of our being, corralling chaos into order…and many more. Here, Romero deftly uses Martin as a conduit to tell a coming-of-age tale, a family drama (which just happens to have a bunch of juicy murders along the way), where a youngster is just trying to find his way in an often confusing world. This, as Martin struggles to controls his Freudian “drives” and turns to a late night talk show to provide a sounding board for the modern-day difficulties inherent in being an Old World vampire. Assuming he is Nosferatu, which is a big assumption. So join us as we remember George Romero, Toronto’s adopted son, and the man who made horror films critically acceptable (to a point). 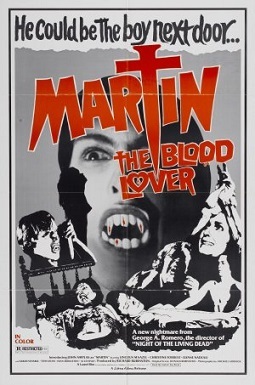 Sure, he’s known for bringing zombies into the public consciousness, but let’s not forget that Martin completely upturned expectations surrounding the vampire mystique.